The Summer that never was - wettest in 17 years - is officially over and we've transitioned into Autumn without noticeable difference. Those of you who have been dancing and praying for rain to break the decade long drought can now stop. Enough rain already. The one good thing about a cloudy day is how the light lends itself to taking half decent pictures. 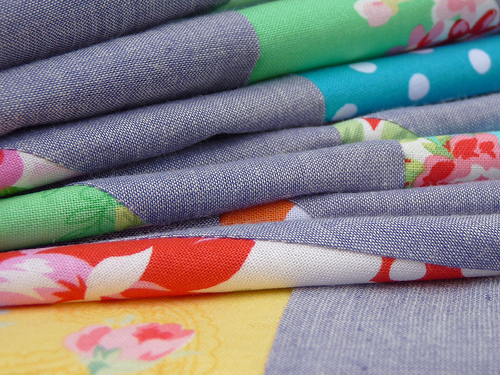 This bundle of fabric is Flower Sugar by Lecien. Sweet and pretty floral prints don't usually make it into my stash, but an exception was made for these strikingly colorful fabrics. Red, green, blue, yellow ... pink. I have been busy processing another batch of half square triangles. It felt like it had been a while since my last HST project, but not so. 140+ HST blocks are pieced and trimmed. I have teamed up the Flower Sugar prints together with some of those from Tanya Whelan's Delilah range and contrasted the prints with a grey semi-solid. The grey fabric is a Shot Cotton by Kaffe Fassett (SC67 - grey). I think I have found a (another) new favorite fabric! Now joining blocks into to rows. It's coming together just as I'd imagined. Pinwheels! My first ever, I think I am learning why you like HST's so much! Lovely - I have been playing with some of this - it is gorgeous fabric. Do you pre wash your fabric when your hand quilting? Random Question i know. 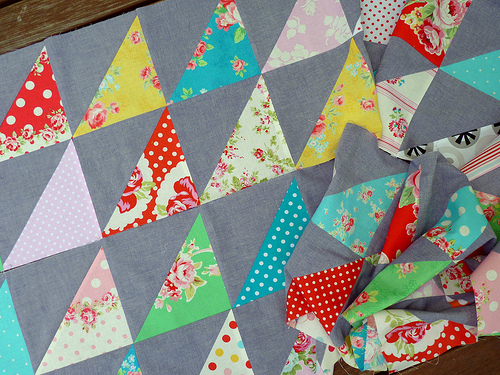 oooh the grey shot cotton looks fabulous with the lecien fabrics Rita! I need to see those Shot Cottons in person. I'm working on a Nikki Tote this week for a birthday present. I have some Amy Butler for the main bag but I'm struggling to find a nice fabric to do the top band and handles. Craft projects can end up costing a fortune for all the fabrics, interfacings etc. Why do we do this? It's cheaper to just buy a gift. I like the flower sugar too, not my normal but lovely and bright. I'm working on a pillow for the March Quilt Blogger's Party! Pretty florals you have there! And blah! to Melbourne's weather! Hi Rita, I can't believe the speed at which you turn out quilts! This weekend I started on my FIRST EVER quilt! It feels great to have finally started it and I can't wait to see how it turns out. Hi Rita! 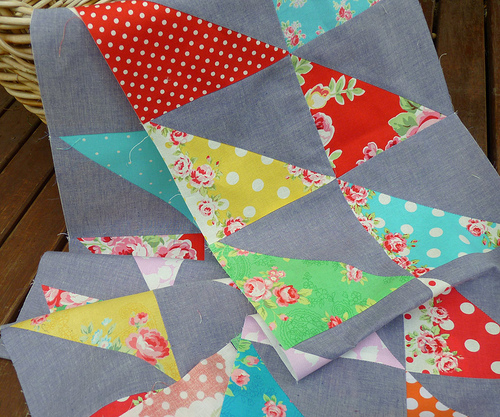 I'm doing the Single Girl Quilt-A-Long in Flower Sugar and I'll have a fair bit left over - maybe I'll have a go at the HST, they look great with the new cotton. Gorgeous florals and you do manage to do grey so well - love the shot cotton. I'm working on a quilt in Flower Sugar too. The fabric makes me smile, it's so beautiful. I have teamed mine with white. So fresh and sparkly. It looks great with the grey shot too. Looking just beautiful!! Love the combo! I'm ditch quilting a 31" feathered star wallhanging, and it's making me crazy! I do like the shot cottons. Finally today I will be able to get some sewing done. I am working on my 4th. quilt from the Material Obsession books...this one is the Strawberry Fields quilt from the first Material Obsession. I have re-named it the Tea Party quilt- I have used several pieces from the Hokkoh Tea Party line as well as some Flower Sugar!!! Such a fun design to showcase those bright beautiful fabrics! This week I am trying to find a backing fabric to match my next quilt. omg that solid is AMAZING! it looks almost chambray. amazing. thx for sharing this. Those are lovely! Wondering if you find the shot cottons a bit stretchy for HSTs? Gorgeous! I love the KF shot cottons...besides being beautiful, they feel incredible (sooo soft). I don't think I will be playing with HSTs for a while (recently made a gray-and-pink triangle quilt for my best friend), but I am having fun with an all-orange string quilt. i love the addition of the grey! it looks great! That's so funny that you mixed in a few Delilah pieces with your Sugar Flower. 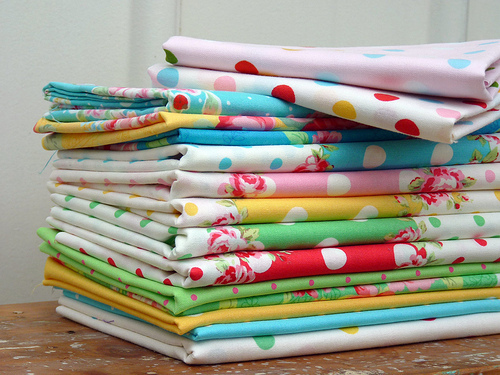 I have a mostly Delilah quilt that I was thinking about mixing some Sugar flower into. I love the contrast with the grey. Doing a quilt with a solid grey is moving higher and higher up my to do list. i have those fabrics too and wasn't sure what to do with them seeing as how they are so bright. i'm liking what you'be got! Beautiful! I've been working on a Schnibbles pattern that I finished last night and posted on my blog just in time! Have a great week! There is a grey Kaffe Fasset shot cotton? I had no idea. And it is such a great grey. Oh, I LOVE that shot cotton ground with those bright triangles! Very fun. Oh my gosh! I have a STACK of Flower Sugar and Delilah sitting in my fabric cupboard for months now waiting to become a king size quilt for my bed! i haven't started yet b/c I've had all these other projects to finish. I LOVE this fabric!! I love that grey! I'm glad you gave the number because I went to Glorious Color and there were like three different greys! I'm obsessed with grey, and it looks fabulous with these fabrics! I've been working on a quilt for my sister's next baby. Its made of Bliss fabric from Bonnie & Camille. The pattern I'm using is "Wild Thing" by Thimble Blossoms. Its a fun way to make pinwwheels. Just about ready to sew the blocks together. BTW I love the bright florals as well. And I much prefer geo/solid/dot/stripy fabrics myself. The grey probably sold me on it. Great choice for the neutral fabric. It's my fav color! Love the HSTs and the gray! I've been knitting a new hat and scarf for my oldest son. There's still quite a bit of winter left here in Canada. Love the print fabrics. They have a cool retro feel to them. I have been busy hand quilting a 25 year old project...a broken star quilt, all hand pieced, also...but in 1987, I was only just learning, and didn't even have a sewing machine! I've been working on my postage stamps quilt. If only my seams would match up so accurately as yours always, always do! I'm working on my Robert Kaufman No Prints Allowed Challenge for the Kansas City Modern Quilt Guild. We meet next week so I need to get crackin'! How do you like working with the shot cotton. It's so soft and luxurious but I wonder if it would be difficult to piece with. You've just provided me with just the grey I need, want ! ! ! I absolutely love your color choices, always. You tempt me with those HST's every time. And those floral fabrics are SUPER pretty.